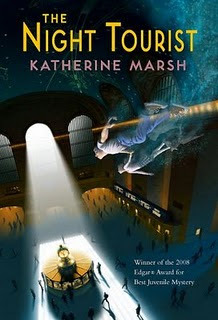 The Night Tourist by Katherine Marsh, is a tale about a boy named Jack. He is a high school boy who also helps his dad at a university. When Jack wanders into a street and gets hit by a car, he is put into a hospital. After he is discharged he meets a doctor who wants to tell him something but doesn't until later. Jack then goes and does a little sight seeing in New York and meets her. He meets Euri, a girl with some huge secrets. Soon enough he realizes that she is a ghost. He asks her to help him find his mom who died after getting hit by a platform. Soon enough this journey becomes a journey through time uncovering secrets that Jack never knew about his family. What really happened to his mom? This book was recommended by my old librarian at my old school. He said that this book was really good and that I should give it a try. It was amazing. Very interesting and it kept me on the edge of my seat. This book contains secrets and surprises that will give you trickles down your spine.